Another season of MAGIC trade show has come and gone, and it's time to review four fashion trends for fall 2018 and winter 2019 in this fashion trend forecast by New York-based firm Fashion Snoops. In this post, I'll be introducing the four macro trends that Fashion Snoops is highlighting, and then going into detail with each fashion theme that relates to each of the macro trends. February 2, 2018 update - See more details about the four Women's trends for fall 2018/winter 2019 in this post on Fashion Trend Guide. 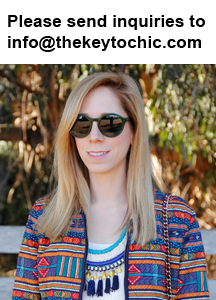 Follow along on my Insta stories @thekeytochic, my Facebook page, and my Pinterest trend boards, where you'll have access to emerging trends, personal style, outfit ideas, shopping reports. For more forecasts, see my posts on top denim trends for 2017, a fall 2017/winter 2018 fashion trend forecast, this spring summer 2018 fashion report, and this spring summer 2018 fashion trend forecast. 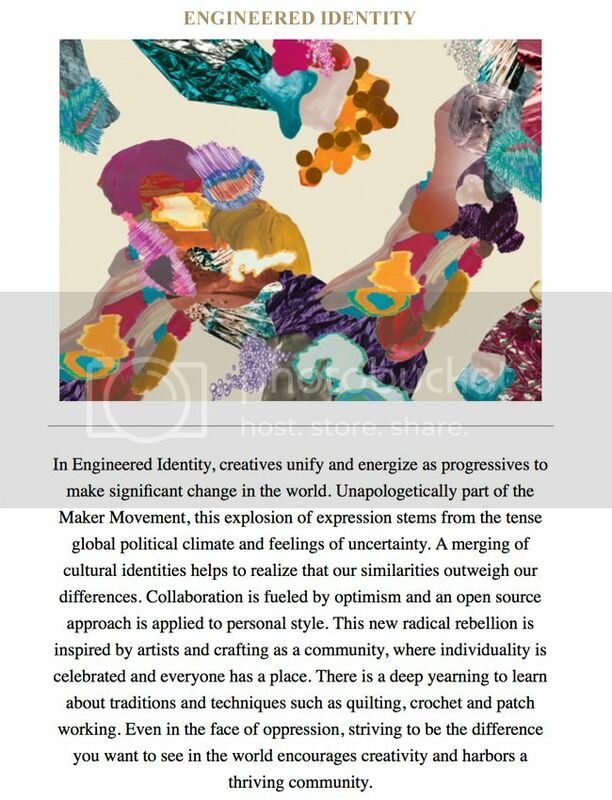 Engineered Identity is the macro trend of an art movement of creative shakers, art as activism, political messaging, and bold statements. The creators of the world take stock of reality as our future becomes destabilized by political upsets around the world. With this tense political climate and our collective feelings of uncertainty, comes an explosion of creative expression. This new maker's movement is galvanized to make a difference in the world by reusing waste and transforming the mundane into expressive art for the people. The Women's trend story is called Vanguard. It evokes the 1970s, a D.I.Y. feel, and the maker's movement. Key colors are yellow, magenta, navy, lavender, pink, and red. Materials are high pile, velvet, corduroy, crochet, mixed media, patchwork, bungee fibers, and resin scraps that are reproduced. There's an undercurrent of female empowerment. Patterns include illusion play, digital prints, storytelling, strong messaging, bold graphics, and organic prints. 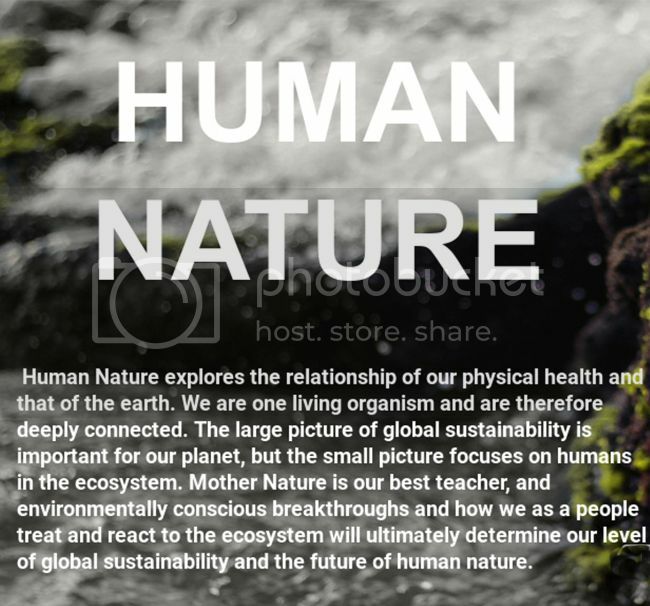 The Human Nature macro trend is about biotech, the farm-to-fabric movement, biotextiles, and reactions to the ecosystem. It includes the maker's movement and handmade crafts. There's a modern eco feel with plastic made from wool and leather-like fabric made from pineapple leaves. 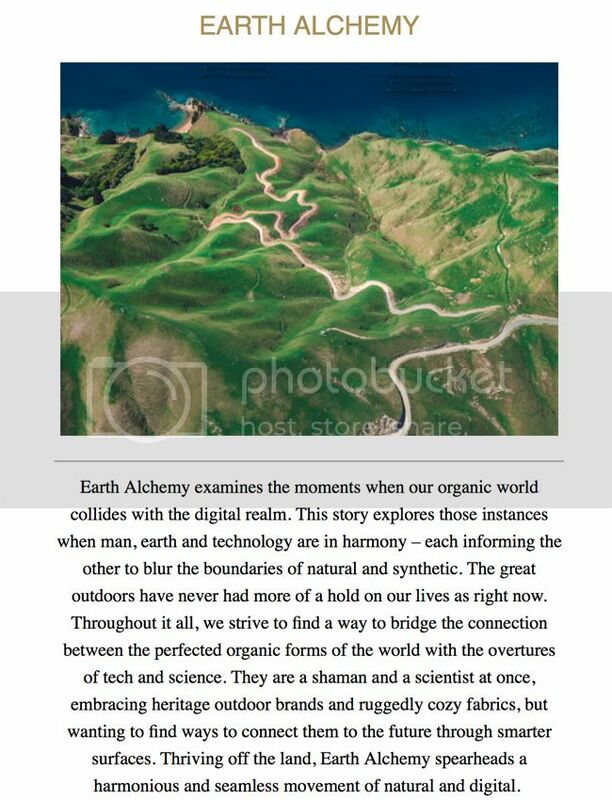 Earth Alchemy is the fashion theme here. It blurs the boundaries of the natural and the synthetic. It examines the moments where our organic world collides with the digital realm. Heritage brands such as Patagonia and The North Face are embraced. The Women's trend story is called Terra. Fabrics reflect layers of life, and come from algae, mushrooms, and pineapples. 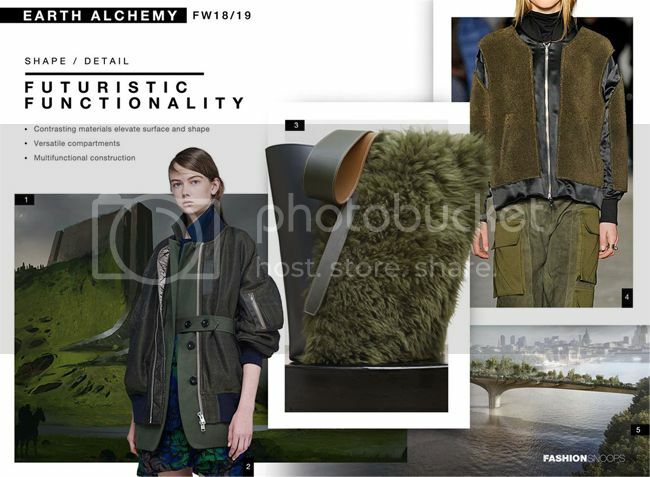 There are plush materials, furry fabrics, mixed media fabrications, utility details, slouchy shapes, and layering. A sci-fi feel comes across in artificial materials, PVC, and transparency. Accessories include sock boots and tote bags. Emotional Capacity is a macro trend about technology, our need to disconnect, feel human emotions, and experience self-growth. 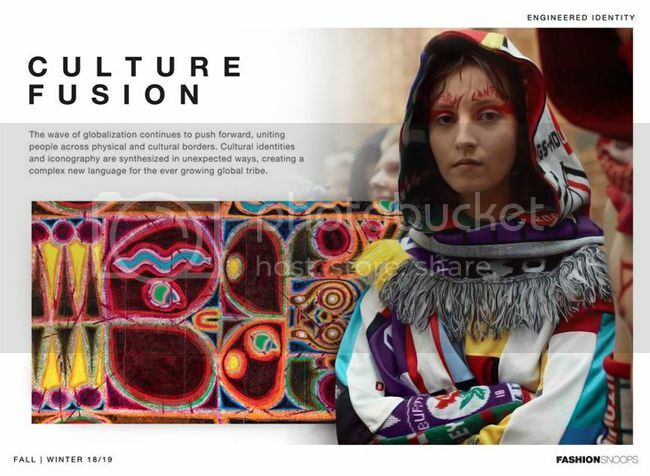 Key influences are sensory textiles, experiential spaces, a focus on mindful living, and inclusion design that makes us connect to one another. The fashion theme, called The Space Between, is where darkness reveals just as much as light. It's inspired by a Japanese aesthetic and is influenced by notable designers such as Rei Kawakubo, Yohji Yamamoto, and Issey Miyake. Colors of The Space Between tell a passionate story. They include samurai red, blues, beautiful neutrals, navy, inkwell, Tokyo Glow pink, teal, and monk yellow. Architectural rigor is a focus, and there's an understated urban edge. Materials are felted wool, refined quilting, and raw stone canvas. 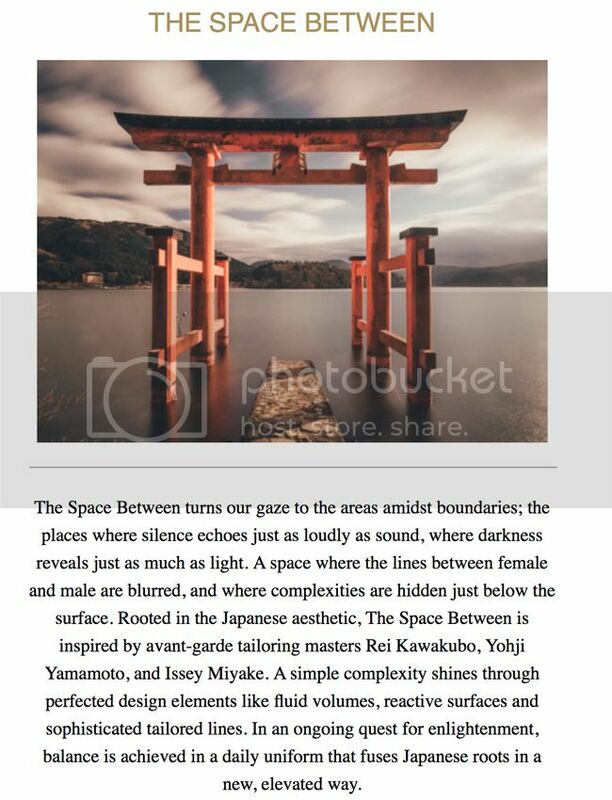 Graphics are illustrated language with abstract formations, scenes of Tokyo at night (urban streetscapes), distorted reality, florals, exotic motifs, and patterns with layering or overlays. The Women's theme is called Sensei, and it features modern Japanese tailoring, minimalist lines, fluid volume, vents, wrapped kimono styling, and elongated tunics. Accessories are minimal with exquisite details, traditional floral, artisanal knots, and high shine fabrics such as jacquard. The macro trend Through Space and Time explores the human journey. We question physical space, the real vs. the surreal, and humans vs. machines. 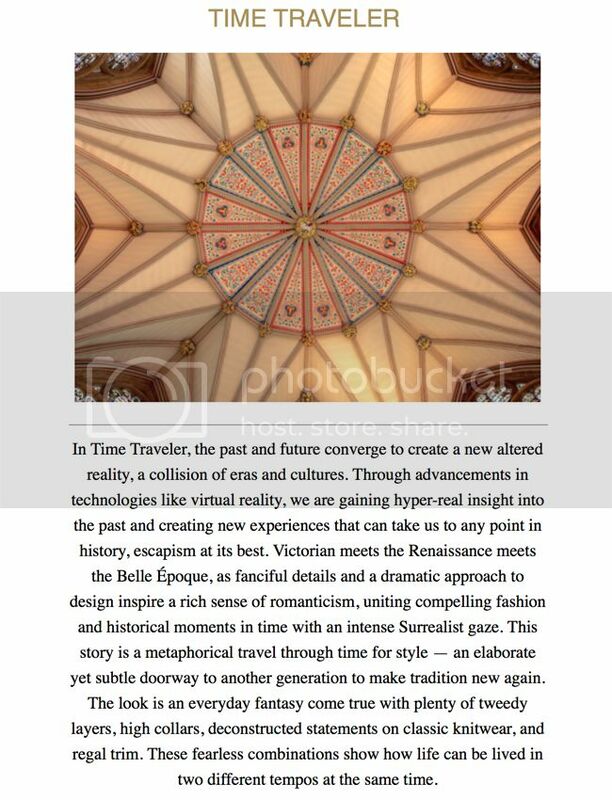 The fashion theme is called Time Traveler. This is where the past and future converge to create a new altered reality. There's a collision of eras and cultures, along with gaining hyper-real insight into the past. It's escapism at its best and a metaphorical travel through time for style. Influences are Victorian, Renaissance, and everything in between. Time Traveler is elaborate, with a focus on heritage fabric mills, Harris tweed, and showing how life can be lived in two different tempos at the same time. See the Burberry spring '17 runway as an influence. Key colors are pinks, blues (especially tech blue), neutrals, and heirloom green. The mood is one of surreal ornamentation, dramatic details, and flamboyant style. Materials are satin, beading (metallic and matte), draping, plastic shell, sci-fi, and 3-D technology. Prints have dense ornamentation, such as brocades, dark romantic florals, and peacock feathers. There are also optical illusions, edited photorealism, and aerial perception. 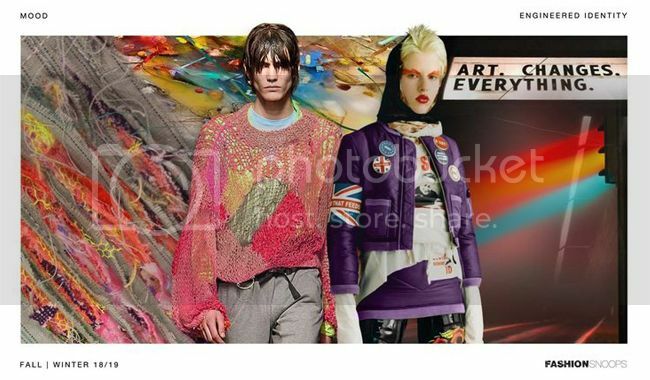 The Women's trend story is called The New Romantic. Clothing features ruffles, Victorian vibes, high collars, puffy sleeves, draped velvet/lace, a focus on pajamas/robes, and slouchy pants. Accessories have an undercurrent of Goth and punk. Trims include lace, pearls, velvet, and rhinestones. Key items are the statement mule and the plush micro bag.